It looks like one of nature’s follies that bears are born during the worst of winter. No other mammal living in the North gives birth at this time. And no other mammals except the marsupials have such immature offspring. Bears have the smallest young in relation to the mother’s body size of any higher mammal. Typically bear cubs weigh between one three-hundredth and one five-hundredth as much as their mother. On average a newborn black bear cub weighs little more than 10.5 ounces (300 g) and is 9 inches (23 cm) long. Brown bear and polar bear cubs are marginally larger, about 17.5 to 28 ounces (500-800 g) in weight and 12 inches (30 cm) in length. If a newborn human infant were that small in comparison, it would weigh between 3.6 and 6 ounces (100-170 g), the weight of a 14 to 16 week old fetus. Even in the most advanced neonatal intensive care unit, a baby born at such an early developmental stage could not be saved. For bears, on the other hand, the birth of premature cubs is normal – indeed, inevitable. 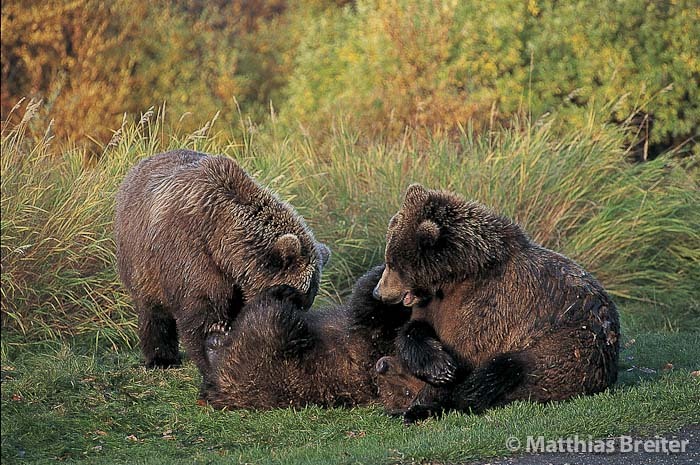 Taken from Matthias Breiter’s book on bears.